Tempest V JJ-F (EJ762), No 274 Sqn in November 1944. Flown by Flight Lieutenant David Fairbanks. P-61A-5 Black Widow, S.No. 42-5534, Shoo Shoo Baby. Flown by 1st Lt. Robert O. Elmore and F/O Leopard F. Mapes. P-61A-5 Black Widow, S.No. 42-5543, Tennessee Ridge Runner. Flown by 1st Lt. John W. Anderson and F/O James W. Mogan. P-61A-5 Black Widow, S.No. 42-5547, Borrowed Time. Flown by 2nd Lt. Herman Elliot Ernst and F/O Edward H. Kopsel. 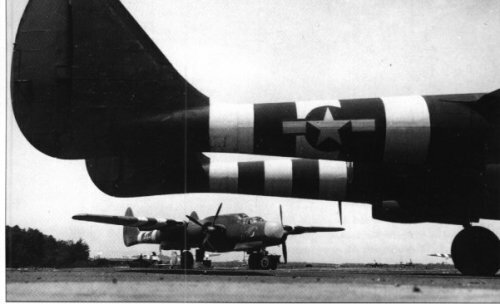 P-61A-5 Black Widow, S.No. 42-5544, Lady Gen. 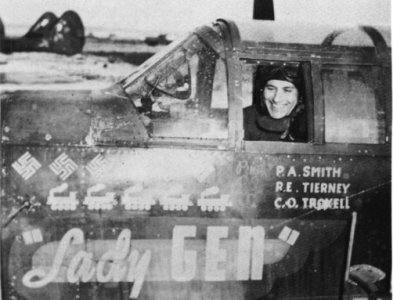 Flown by 1st Lt. Paul A. Smith and 2nd Lt. Robert E. Tierney.